Marchesi di Grésy is a family owned and operated business that has been in existence since the late 18th century but it wasn’t until 1973, under the direction of current owner Alberto di Grésy, that the family decided to release wines under their own label. The focus of the portfolio is their stunning Barbaresco, however there is a wide range of styles produced, including international varieties such as Chardonnay and that was the wine we began the evening with. Dinner was at The Continental in Pacific Place with Wellspring Wines and the affable Marchesi di Grésy Cellar Master Jeff Chilcott. We began with a dish of griddled scallops with chestnut purée, shiso and lemon – a perfect accompaniment to the Chardonnay. On tasting, the Chardonnay showed mouth-watering notes of citrus curd and a burst of fresh white flowers. The palate was sophisticated mineral and citrus flavours leading through to delicate honeysuckle on the finish. 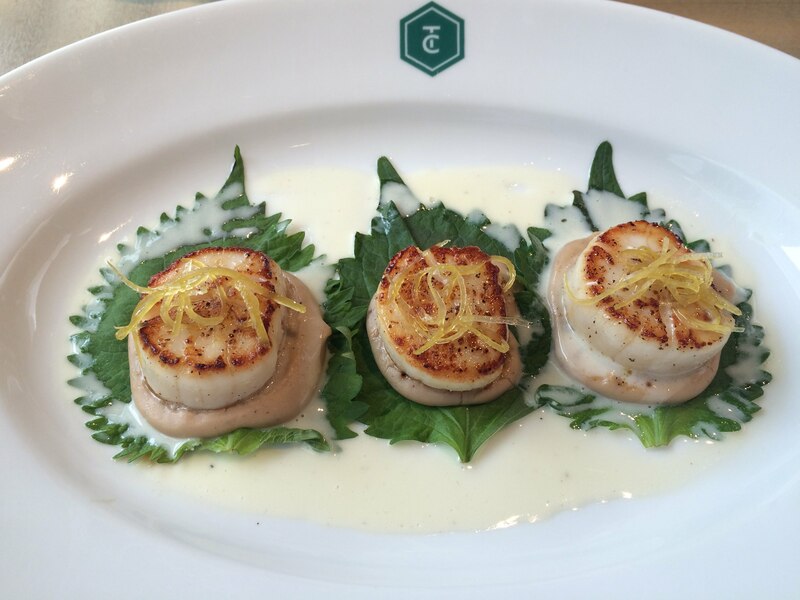 The wine’s refreshing citrus notes found a natural partner in succulent scallops garnished with lemon zest. The wine sees new French oak for 22 months and the sweet notes of oak nicely complemented the sweetness of the scallops and rich chestnut purée. Next was the Dolcetto, a wine that is made to drink in youth and this was a fine example. Lots of ripe juicy fruit with a good dose of spice to balance the fruit – the perfect quaffer! The main course was partridge with jamón, chickpea purée and almond picada and for this we enjoyed the Martinenga Barbaresco 2006, Gaiun Martinenga Barbaresco 2005 and the Camp Gros Martinenga Barbaresco 2004. The wines were a good match to the dish with the ripe fruit notes and structure of the Camp Gros showing particularly well against the partridge. The evening finished with a cheese course and the Gaiun Martinenga Barbaresco 2001, which I think everyone agreed was the wine of the night. Speaking with Jeff he felt the wine was just turning a corner and starting to show a little of its age which I couldn’t agree with more. Very fresh and lifted on the nose to start, with notes of development starting to show as the wine opened in the glass revealing a touch of cigar box, leather and dried herbs. Marchesi di Grésy own four estates in the Cuneo and Alessandria provinces of Piedmont, however the Barbaresco is sourced from Piedmont’s only monopole, the Martinenga estate, which has been under family ownership since 1797. Of the 24 ha. on the estate approximately 12 ha. are devoted to the production of Barbaresco and three different mesoclimates have been identified within those 12 ha. Martinenga is the largest plot and typically provides Barbaresco in a comparatively lighter style, which was true of our tasting. The 2006 Martinenga showed notes of red fruits, menthol or eucalypt and herbs within an elegant frame. By contrast the Camp Gros, the second largest of the three plots, produces wines that are more powerful in character. The 2004 again proved this to be the case with darker fruits, mineral and tobacco notes all showing in a wine that was fuller on the palate. What struck me about these wines is how consistent they were in their style – a style of careful and thoughtful craftsmanship. The well integrated acidity and consistently fine textured tannins combined to provide a structure within which each wine revealed its personality – or perhaps more importantly, the wines were all really rather delicious and dangerously drinkable!